Raised decks are more and more popular because of the daylight windows. People love daylight windows so their basement’s aren’t so dar. But now you have to do some sort of raised deck. A lot of Oakland County homeowners love brick pavers. How can you do a raised deck and have brick pavers? This is how. 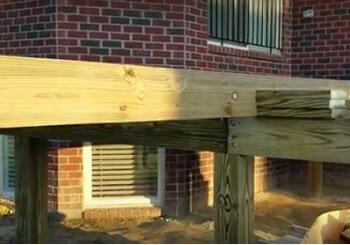 We have the engineered deck plans to put in oversized footings, larger lumber, heavier beams, and joists to hold the weight of brick paver decking. For a raised patio in Washington Township, Shelby Township, McComb Township, and Oakland Township give us a call at 586-752-2200.